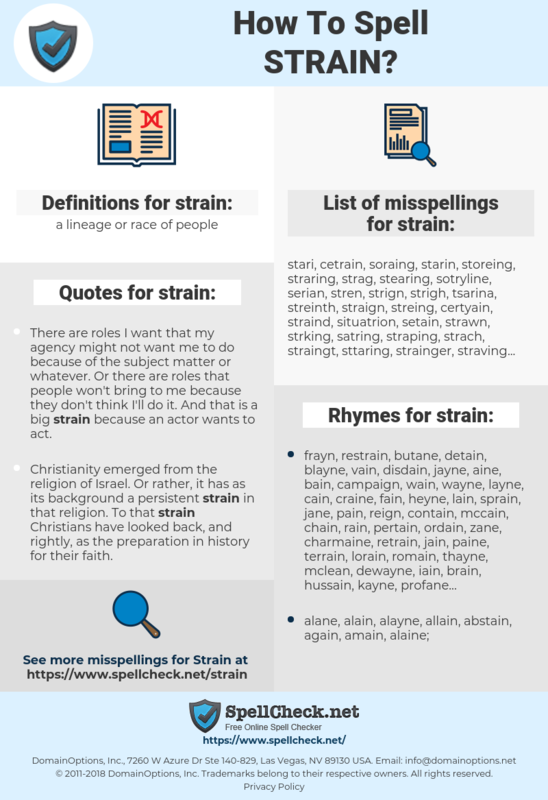 What are the misspellings for strain? What are the common mistypes for strain? What is the definition of strain? What are the quotes for strain? What are the rhymes for strain? What are the translations for strain? 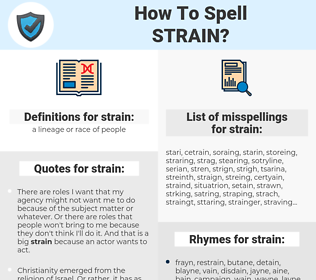 What are the common typos for strain? This graph shows how "strain" have occurred between 1800 and 2008 in a corpus of English books. There was absolutely no strain in marriage. Marc and I understand that this is a business. We have no problem separating our personal life with our personal life. And we have a very strong relationship. stam, druk, spanning, belasting, forceren, inspanning, zeven, verrekken, overbelasting, verrekking. fardeau, souche, tendance, effort, fatigué, foulure, accablement. Beanspruchung, beanspruchen, Anstrengung, Belastung, Kraftaufwand, belasten, passieren, Zug, Spannung, Stamm, Zerrung, abseihen, zerren, Verzerrung, Druck, strapazieren, anspannen, ziehen, Dehnung, Anspannung, Strapaze, Bakterienstamm, Überanstrengung, Verformung, Überlastung, Deformation, starke Inanspruchnahme, Verdehnung, Erregerstamm, überanstrengen, sieben, überlasten, spannen, verrenken, pürieren, seihen, durchseihen, Pression, Tension, Stress. ひずみ, 歪み, 過労, 漉す, 濾す, 凝らす, 力を入れる, ひきしめる, 息張る, 勉む, 努む, 力む, いきばる, きんぱく, 緊迫, 引締める, 引き締める, ちからをいれる, りきむ, かろう, 極度の緊張. pressão, tensão, variedade, coar, esforçar-se, distender, esticar, estresse, puxar, linhagem, espremer, fadiga, luxação. штамм, напряжение, растяжение, черта характера. tipo, variedad, esforzarse, tensión, cepa, esfuerzo, presión, torcedura, esguince, colar, escurrir, forzar, filtrar, estirar, perjudicar, desgaste, tirar, torcer, peso, raza, deformar, cansar, tensar, vena, estirpe, tirantez, sobrecarga, estrago, saturación, sobrecargar, hacer fuerza, poner en tensión.